Here are some answers and tips which can help you decide what kind of product would be the best choice for you and your dog. We accept orders via email infogalgina@gmail.com. From customers outside Slovenia we accept payment via PayPal and via bank transfer. Shipping and handling costs are charged according to the price list of shipping provider Pošta Slovenije. When all details are determined, sewing is done in a day or two. More complicated items such as coats, bags and other unique made items usually take more time. On rare occasions it can take up to 10 working days to complete your order. For all foreign countries (other than Slovenia) we accept only payment in advance. Mainly because they are all made-to-order. Unfortunately that’s not possible, as fabric may vary and some patterns repeat more often than others. No matter how hard we try to show you every detail of the pattern, photos are still symbolic. Be careful when choosing fabric for narrower/smaller items as it is difficult to fully capture some big or diverse pattern on them. Let us know if you want some specific part of the pattern to be used on your item. You can use normal laundry detergent and wash them by hand or in washing machine at 30 degrees C with similar colors. We recommend using gentle cycle and a bag for delicate fabrics for machine washing. Do not use any aggressive stain removers or bleach and do not tumble dry. Do not rub items with different brushes. After washing, items should be left in a shade to dry. No, we do not use fabrics from our customers. No, we do not sell our material supplies. Each collar is made-to-order and is costumized to fit your dog. Photos only represent fabrics that are used for all of our products. Fabrics for collars are usually shown on a 5 cm wide martingale collar. No, they are suitable for almost every dog, you just have to choose the right collar (type, width, size). All options are listed on pages “About us” and “Price list”. No, we don’t sew them in advance. Exceptions are samples which we need for photographing. When you choose product, model and fabric we will sew another (custom made) for you. You can cut off pieces of paper or fabric in different widths and put them around dog’s neck as a collar. Collar shouldn’t hinder your dog from moving and it shouldn’t cover whole neck from ears to shoulders. For bigger sighthounds (Spanish greyhound, Greyhound, Saluki, Irish wolfhound, Afgan hound, big Whippet) 5 cm is the most appropriate width. 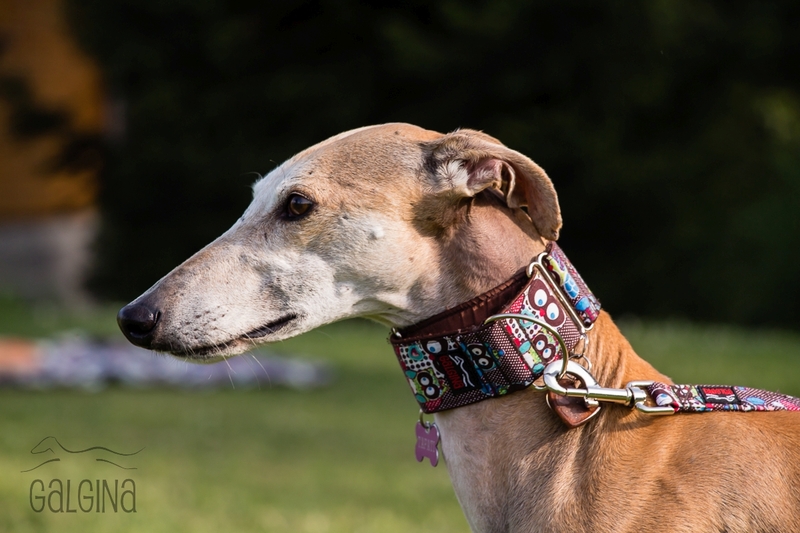 For smaller Whippets and Italian greyhounds 3,6 cm is the most desirable collar width. For puppies we recommend Puppy collar which is 2,5 cm wide. For all other breeds and mixes it depends on length of the neck. Longer the neck, wider the collar can be. Of course, just tell us what color you like when placing an order. You can add link to the photo. Use measuring tape or cord and measure in the middle of the neck and close to the neck. Do not add additional cm for reserve. Measure the dog’s head on its widest point. Please accurately measure your dog as we totally depend on given informations and we do not accept returns due to wrong fit. Let us know if your dog is a puppy, has thick fur or you want the collar to be more tight/loose. Measure dog’s neck in point A and head in point B as shown. – other special notes (thick fur, puppy, breed, individual whishes …). Yes it is. In that case we add some reserve for growing period so you can use the collar longer. Yes, inside is a strong nylon strap. Still, you are using all of our products at your own risk. 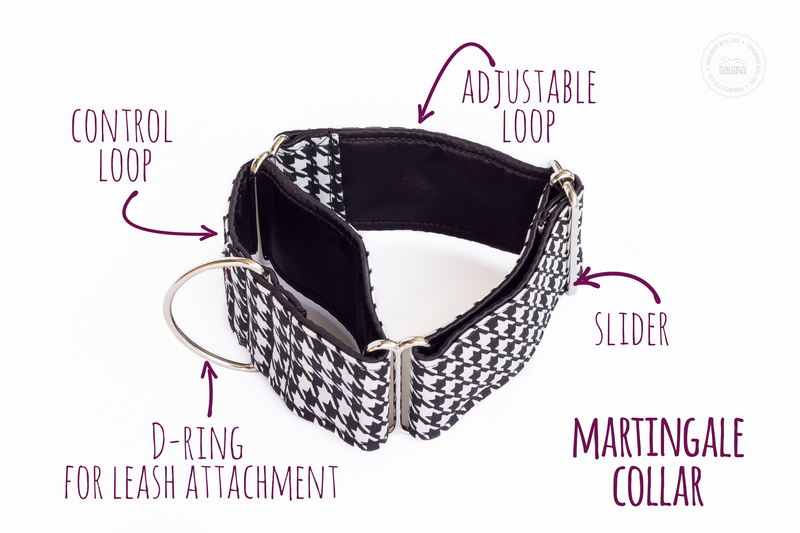 Martingale collar is made of adjustable and control loop. When the leash is pulled, seperated control loop closes through two different rings. Collar tightens up evenly around the neck and size reduces greatly. This type of collar can be adjusted with a slider and should fit closely even when walking on a loose leash. We strongly recommend it for timid dogs, adopted sighthounds and dogs with a tiny and narrow heads. 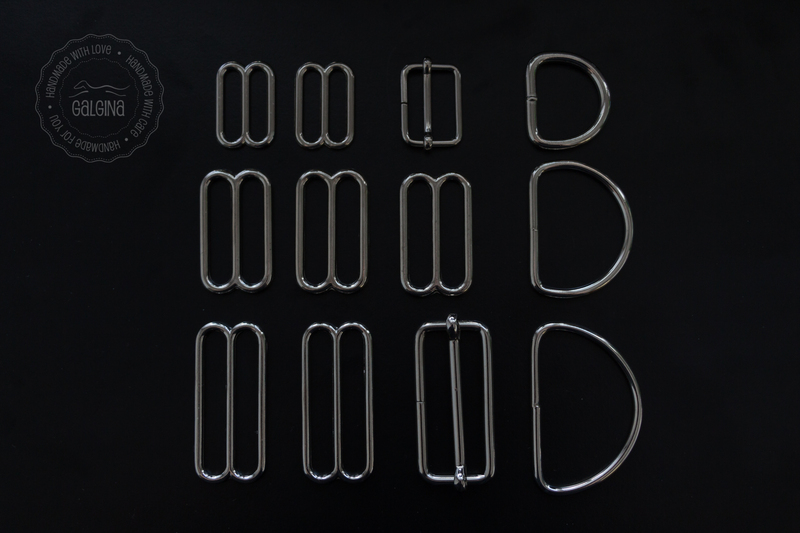 Due to the tightening effect martingale collar should be used on dogs only under owner’s supervision. If the collar fits properly there is very little chance your sighthound will slip out of it. You should be very careful when putting collar on your dog’s neck. Martingale collar has to be adjusted with the slider for the first time before you put it on (to loosen it). When the collar is on the neck you should adjust it with the slider for the second time to tighten it. When the size is right you should be able to put two or three fingers between dog’s neck and collar. It is very important that two rings that hold the control loop are not touching each other. In fact, they should be as far away from each other as possible. Control loop should never hang freely away from the neck when leash is loose. Only then control loop will close properly and collar will tighten when leash is strained. Properly fitted martingale collar on a sighthound. That’s because you can’t open a martingale collar. You simply put it on and off over your dog’s head. Sometimes breeders are willing to help and they measure the puppy for you. Sometimes that’s not possible, so any other information such as height, weight, age, size, breed, constitution or ever photo come in handy. Without neck size we can still miss and collar is useless. If you are not sure we will settle the size right it’s better for you to postpone the order until your new family member arrives. No, none of the collar will stop that behaviour by itself. 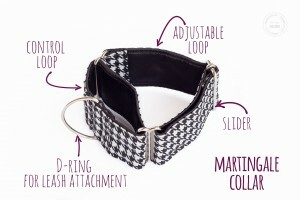 Martingale collar is used only for safety reasons, when you don’t want your dog to slip out of it and become unleashed. Prolonged pulling can cause serious damage to your dog’s neck and your arms, walking like that in not a joy for you or your dog. The easiest and most effective way to solve behavioural problems is with the help of a good dog obedience trainer. 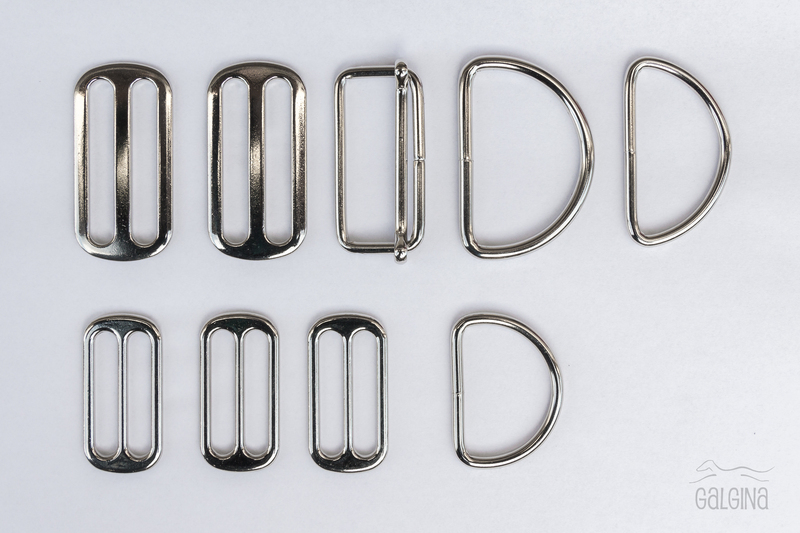 All metal parts are rounded so they don’t tear the fabric like flat ones do. 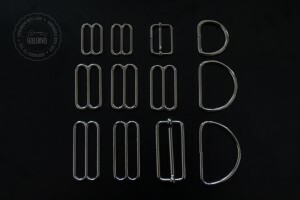 Some parts are welded and some are casted. 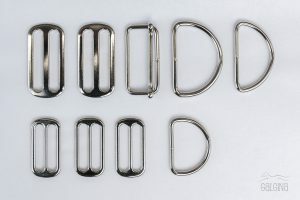 Pictures show metal parts that are usually used for martingale collars. That depends on many factors and combinations of them. To begin with, durability depends on the type of the fabric, thin cotton and silk can be worn out pretty fast. It also depends on how often do you use the collar, is your dog wearing it 24/7, or just during walks, do you allow your dog to swim with it (dirty water, salt water) and play in the mud, how long is the collar being exposed to various weather effects such as sun (outdoor dogs), does your dog pull on the leash … Also depends on how you take care of the collar, if you wash it too rarely than dirt gets deep in, or the collar even fully fades when it is being washed too frequently. After all, it also depends on an individual’s perception of when the collar becomes useless. By all means, the life expectancy of fabric collars can’t compete with a lifetime of leather and metal collars, nor is it meant to last forever (or 10 years). It is kind of the same as with our everyday wardrobe. We all change it sooner than after a decade of use. Any collar showing signs of stitching and metal damage (cracks, rust) should be replaced. No, all our harnesses are intedend for dog walking and they are not tested in a car crash. Our pattern fits sighthounds best. You can arrange a fitting with our seamstress so she can tell if the pattern can be adjusted to fit your dog. Do you have another question? Contact us via infogalgina@gmail.com, we’d be more than happy to answer.